‘Twittering’ fires a bolt of immediacy and brevity into the busy tangle of social networks, but will it find an audience beyond geeky technologists? “What are you doing?” asks twitter.com, neatly surmising the simple conceit of twittering. Answering the call are the ‘tweeters’, who do so by submitting concise updates of their daily workings to a network of friends, family and contacts, using a variety of different media, including instant messaging, the internet and SMS on a mobile phone. Since it launched in 2006, as a side project from the brains behind podcast and audio site Odeo, this ‘diary-by-Haiku’ has attracted an impressive army of devotees – including high profile subscribers like British Prime Minister Gordon Brown and news companies like the BBC – but also large number of critics, who see it as another pointless distraction in a world already struggling under the weight of information overload. Such criticisms were also levelled at blogging, a platform that twittering shares a lot of common ground with. But whereas blogging has a tendency towards long-windedness, twittering snaps to the point. It also has the added advantage of being much more mobile, making it particularly useful to those who live life on the move rather than tied to their desk. Tweeters post mini-blog entries of up to 140 characters using their mobile phone, instant messaging service or through the twitter.com webpage. These postings then appear on your own personal twitter page, available to view by your twitter ‘friends’ or - if you want the world to know what you’re up to – anyone. The choice is up to you. The idea though is to build up a circle or community of twitter friends. This is when the platform comes into its own and shows itself to be a powerful and functional social network. When friends receive updates about each other via their mobile phone or webpage they can share glimpses into their daily lives, but also exchange ideas, offer advice and raise queries, and use it as a conversational tool to trigger discussions. Twitter friends don’t even need to be friends, family or contacts. In addition to Gordon Brown – or his representatives – keeping interested tweeters informed about the Prime Minister’s daily comings and goings to and from 10 Downing Street, the BBC posts minute by minute updates of news flashes and the internet recruitment agency Monster.com sends out notes about new jobs. Twitter’s fanbase is certainly growing – festivals such as the SXSW music festival in Austin, Texas provide a fertile breeding ground for tweeters because up-to-date information on the move is very useful in such a mêlée of activity. However it remains to be seen whether its future will extend much beyond the short term. When the internet becomes ubiquitous, available on every mobile phone and laptop around the world, will twitter still have a role to play in communicating its fast and snappy bursts of information? 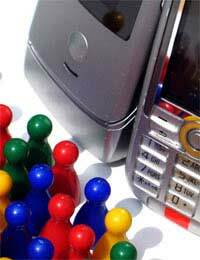 Can You Avoid Paying for Freephone Calls on Your Mobile? Can You Use a Mobile as a Sat Nav?